The search for a safe and effective HIV vaccine is a major scientific and clinical challenge. In an exciting new Nature Medicine paper published earlier this week, researchers at the Ragon Institute and their collaborators uncover important insights into how antibodies provide protection following vaccination. These findings bring researchers closer to an HIV vaccine that, if achieved, would have immense ramifications for global health. Despite ongoing efforts to identify and develop HIV vaccines, a rational design approach has been hindered by scientists’ limited understanding of vaccine-induced antibody protection at a mechanistic level. To tackle this obstacle, senior author Dr. Galit Alter and her team of researchers combined monkey immunization studies, with “Systems Serology” based comprehensive vaccine-specific antibody profiling, and computational approaches to elucidate antibody functions prior to infection of non-human primates. The study was co-supervised by Dr. Margaret Ackerman at Dartmouth and Dr. Mario Roederer at the Vaccine Research Center/NIH, and Dr. Jishnu Das (Ragon Institute) and Mr. Srivamshi Pittala (Dartmouth) led the computational analyses. 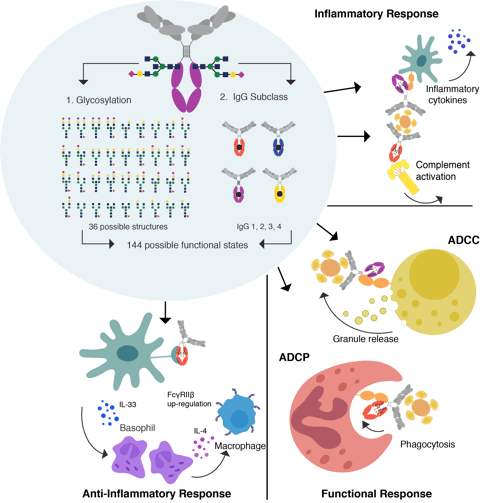 Understanding how a diverse pool of antibodies mediate an immune response using multiple different mechanisms. mechanism by which antibodies provide protection is unclear. For most clinically approved vaccines, antibodies able to block infection – otherwise known as neutralizing antibodies – are critical for vaccine protection. In HIV, vaccines that offer protection, do not induce neutralizing antibodies. Thus one key goal in this study was to identify the specific antibody functions that are associated with vaccinated monkeys that showed greater resistance to infection. The researchers also investigated whether the same antibody functions were associated with protection using a different route of administration by comparing a group of monkeys vaccinated through intramuscular injection to another group that received the same vaccine through aerosol spray. The researchers found that both intramuscular and aerosol vaccination were equally effective. They further discovered that regardless of the route of vaccination—intramuscular or aerosol—resistance to infection required antibody-dependent phagocytosis, the process in which viruses or infected cells are engulfed and destroyed by the immune system. Thus in the absence of blocking infection, antibodies protect by recruiting the immune system to destroy the infection. Strikingly, while both intramuscular and aerosol vaccination involved phagocytosis, the different monkey vaccination groups showed notable distinctions in the specific types of antibodies and cells that were most involved in resistance. Monkeys immunized by intramuscular injection showed phagocytosis that was associated with IgG antibodies and monocytes, a type of white blood cell. By contrast, resistant monkeys that received aerosol vaccination displayed phagocytosis that was associated with IgA antibodies and neutrophils, another type of white blood cell. Altogether, the authors not only identify phagocytosis as a common feature for protection and resistance against viral infection but also demonstrate that there are multiple mechanisms, involving distinct antibodies and immune cells, which are involved in vaccine-induced immunity. These findings not only point to specific antibodies that can be harnessed in future HIV vaccines but also to a design strategy that leverages combinations of mechanisms, rather than any single process, for the most effective protection against HIV. While developing a truly effective HIV vaccine remains a formidable task, these novel findings offer critical mechanistic insights that address longstanding scientific roadblocks, thus helping to pave the way to the ultimate goal of an HIV vaccine. Photo of Galit Alter (Professor) and Jishnu Das (Computational Fellow) and figure courtesy of Galit Alter.